Simplicity and elegance combine in the perfect lines of this vanity. With 2 soft close drawers and sleek brushed pulls, this bathroom vanity is modern simplicity at its best. The drawers feature Blum soft close drawer sliders ensuring they close silently and effortlessly every time. 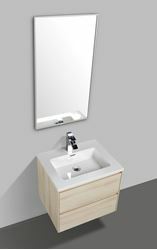 The cabinet has a beautiful white integrated basin and countertop with unique angles and graceful curves made of highly durable acrylic-resin with integrated rectangular overflow. The price is for the basin + cabinet only. It excludes the mixer, the basin waste and/or mirror.